UrbanizeHub and KeepItSimple have been working hard towards organising a groundbreaking event that puts connected communities into the spotlight, made up of a Conference and an Innovation Hackathon on two main tracks: The Future of Manufacturing and The Future of Communities. 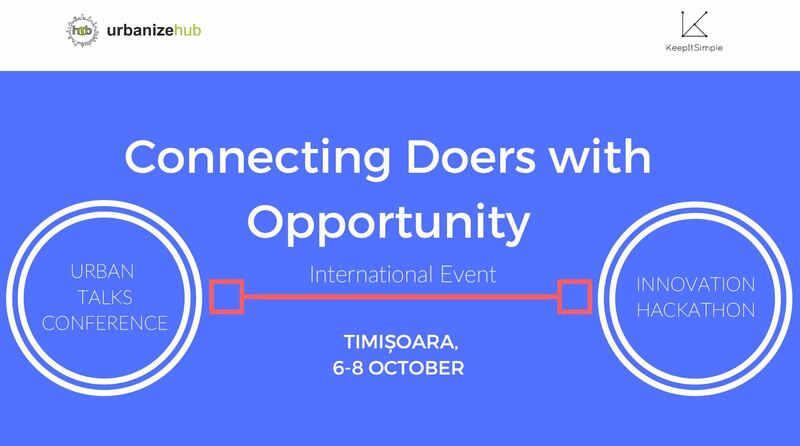 Connecting Doers with Opportunity will take place in Timisoara, between 6-8 October 2017. This will also be the first in a series of Urban Talks Conferences, which UrbanizeHub will bring to multiple Romanian cities starting this year. Friday will end with a Networking Party, where speakers and participants will be able to form meaningful connections and embrace opportunities for recruitment, partnerships and knowledge-sharing. The unique component of the event is the Innovation Hackathon, which will generate the proper context for participants to generate IT solutions for local, national and global challenges. The two main tracks of the hackathon will be The Future of Manufacturing (based on the blockchain technology) and The Future of Communities. 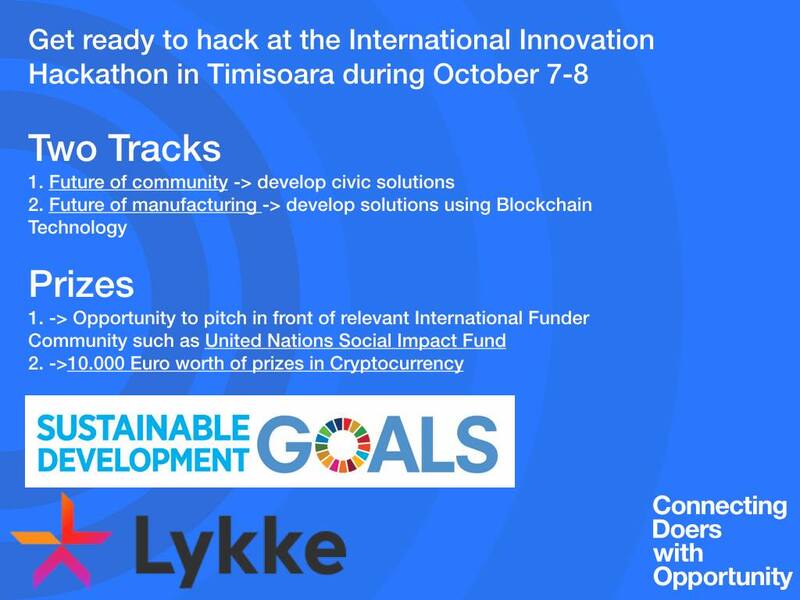 The Hackathon will spread over two full days (October 7th & 8th) and will reward the best projects with prizes worth 10,000 Euros in cryptocurrency at the end. Are you a start-upper and want to find out more about alternative financing opportunities, sustainable start-up ecosystems, Sillicon Valley, and some great examples of success? Are you a web developer, a tech enthusiast who wants to see how innovative ideas can create a better world? Do you want to find out more about blockchain technology and get in contact with global networks of investors and tech people? Do you want to participate in an Innovation Hackathon and show off your skills and ideas for a better world? Come to Connecting Doers with Opportunity, an international event that includes an Urban Talks Conference and a 2-day Innovation Hackathon, with prizes of up to 10,000 € in cryptocurrency for the most innovative ideas! Participating in this event will give you the chance to connect with Doers from around the world, meet potential employers and create partnerships with people who are interested in your ideas. Connecting Doers With Opportunity will bring together speakers and participants from all over the world, all with unique backgrounds and experiences. Recruitment. The entire event, and especially the Hackathon, will give companies the opportunity to find talented individuals and follow-up with them for recruitment or collaborations. Check out our presentation to find out more about getting involved! This event is more than a Conference and an Innovation Hackathon for global Doers, it is an in-person three-day collaboration with extraordinarily talented creatives and innovators from all around the world, who use their skills to make a positive impact within their communities.